TRE-FOR Park, originally called Odense Stadion, opened in 1941 and stayed relatively unchanged until the 1990s. However, with the successes of the club in the early 1990s, it became increasingly clear that the club needed more modern facilities to be able to compete successfully. A first step was the conversion of standing areas into seats, but soon after was decided to redevelop the stadium altogether. 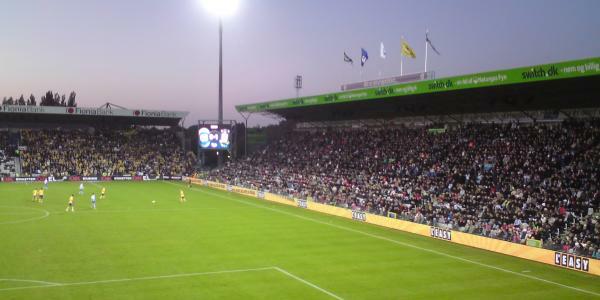 Works began in 1996, and by September 2007 three of the four stands had been rebuilt. Two months later the redevelopment was completed with the reconstruction of a new main stand. The main stand underwent a next renovation in 2004, which mainly focused on increasing the VIP facilities. In 2005 the club sold the naming rights of the stadium to Fiona Bank, resulting in the new name Fiona Park. Five years later the name changed again after energy group TRE-FOR bought the naming rights as part of a five-year sponsorship deal. TRE-FOR Park is located about 2.5 kilometres west of Odense’s city centre and its main railway station. The stadium lies in a mainly residential area. 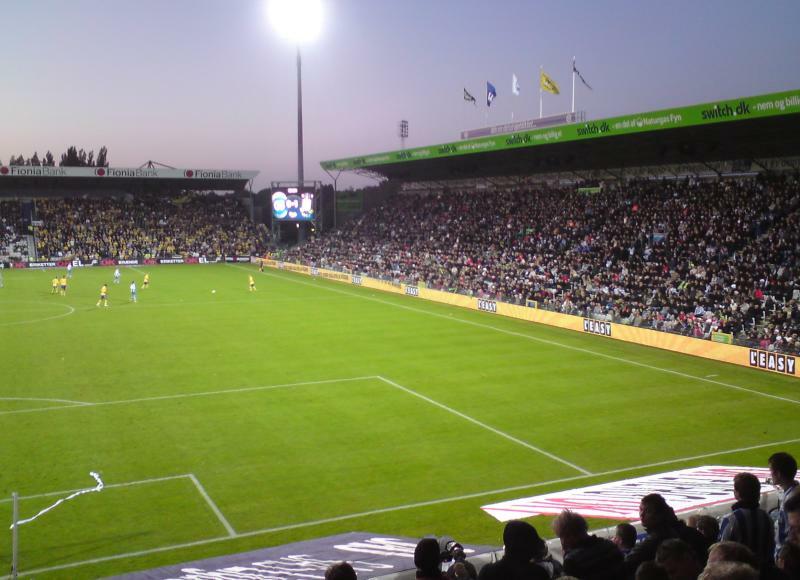 By car, if coming from the E20 west, take exit 53 Odense V. Follow the 161 in the direction of Odense for about 8.5 kilometres and turn left into the Stadionvej. The stadium lies a few hundred metres ahead in front of you. If coming from the E20 east, take exit 51 and follow the signs for Centrum. At the crossing with the O2 turn left onto the O2 and after about 2 kilometres turn right toward Stadion. A few hundred metres later turn left into the Stadionvej. By public transport take bus 31 from the rail station or the city centre. Get on the bus in the direction of Bolbro and get off at stop Stadion. The ride takes slightly more than 15 minutes. Alternatives are bus 21 to Ubberud, 28 to Villestofte, 29 to Fuglebakken, or 121 to Hårslev. Get off at stop Stadionvej. The bus ride only takes 5 minutes, but it’s another 10 minutes walking to the stadium. Address: Højstrupvej 7B, 5200 Odense V.
Tickets for Odense matches can be purchased online, or at the ticket office at the stadium. Tickets can also be bought at the stadium on the day of the match from 3 hours before kickoff. Only few Odense matches sell out. Tickets have a single price of DKK 120.00, which is increased to DKK 150.00 for the matches against FCK and Brøndby. For more information email clubob@ob.dk. OB.de – Official website of Odense Boldklub. Visitodense.com – Official travel guide to Odense. Fynbus.dk – Odense public transport information. Rejseplanen – Public transport route planner.